After a 30 minute drive, we will arrive at Ain Khudra where we will receive our camels. Our Bedouin guide will lead us to the mysterious pre-historic buildings called Nawamis where we will arrive after a camel ride of approximately 40 minutes. These constructions made from sandstone are between 2 and 2,5 meters high and have a diameter of 3 to 6 meters. Their openings are all facing west. It is assumed that they served as graves built in the Copper Age (4000 to 3150 B.C.). During excavations different burial presents were found, such as shell bracelets, colorful pearls, cans and tools made from copper and bones. After visiting the Nawamis, we will have a little break. 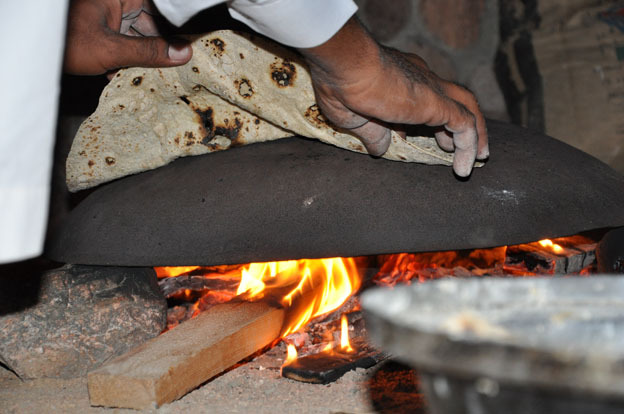 Our Bedouin guide will serve us freshly baked bread and refreshing tea. 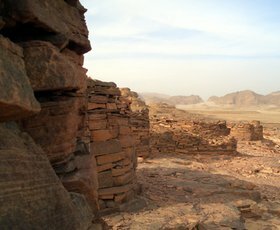 With our strength regained, we will continue our tour by driving to Ain Khudra where we will take a look at the famous rock paintings, which are situated at the ancient pilgrim’s path from Ain Khudra to Saint Catherine. Immerse into the ancient times of the Sinai by visiting these fascinating buildings..
Get to know the desert with its inhabitants and customs close up.